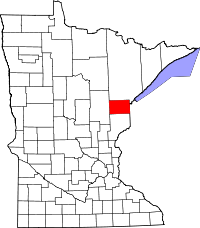 Carlton County, one of the smaller counties in northeast Minnesota when compared to the much larger counties surrounding it, provides the county vital records at the office of the Court Recorder in the county seat of Carlton, MN, on 301 Walnut. The office stores and provides access to birth and death records, marriage indexes, military discharges, property records, and others. The office should be contacted directly to inquire as to years of availability. Copies of birth certificates cost $26, death certificates are $13, and marriage certificates are $9, and all copies are certified. MOMS is also linked to from the Recorder website for access to marriage records. The Minnesota GenWeb Project has a Carlton County Genealogy and History page that provides a number of resources, such as census records, cemetery listings, and much more, with most of it dated from the mid 1800s up to present day.